Have you ever thought that the AI could really replace humans as being the News Anchor? Well it has happened! From the Sources it is known that the world's first Artificial News Anchor has made "HIS" debut on one of the Chinese news channel. The AI anchor hosted a news show at the ongoing fifth world Internet Conference in the east China's Zhejiang Province. This news Anchor is marketted in a very intresting way to the chinese people as the "World's First AI News Anchor & that 'He' will accompany them 24 Hours a Day, 365 Days a year"
The News Anchor has been named Xinhua, and it is reported that 'He' is put in a tight security environment by the Chinese administration, and the Anchor will only follow a script and will be closely monitored for the flow of information, people are now starting to wonder what the mix of AI will do. The news anchor is based on the latest AI technologies (most of machine learning), has a male image with a voice, also has actions and emotions of a real person. The Anchor learns from live broadcasting videos by himselves and can read the text on paper as natuarally as any other Human being as claimed by the sogou.com. This news anchor is jointly developed by the Chinese search engine company, sogou.com and by Xinhua itself. 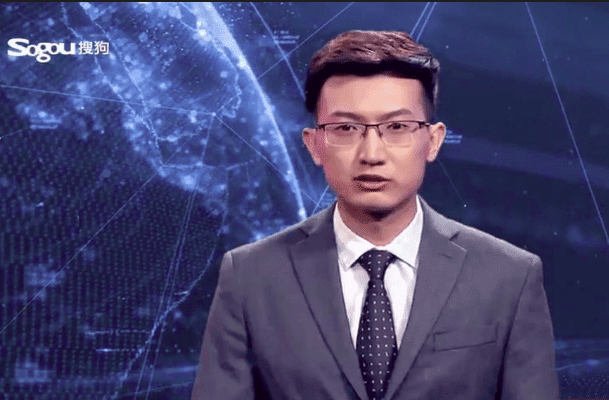 According to the makers "Xinhua" the main purpose behind creating this AI News anchor was to improve efficiency and reduce the production costs, "He" has became the member of the reporting team and can work for 24 hours a day on their official website and their social media platforms. One thing which is worth noting is that the chinese have been working for the creation of AI News anchor for quite a while now. For instance, In 2015, One of the major Chinese News company, Shanghai Dragon TV had used a robot for a weather reporter on its live show, which even then evoked several negative reactions among Chinese media that in near future these machine may threaten their jobs.